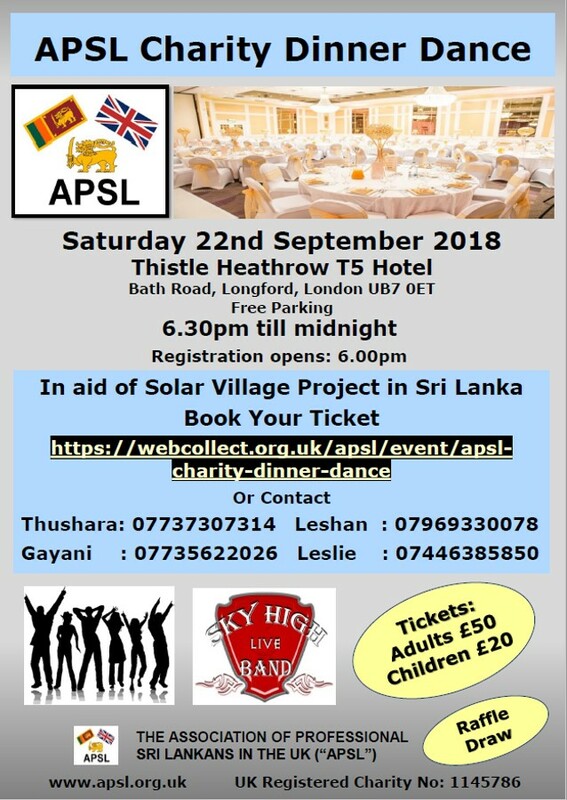 It is with great pleasure that we would like to inform the APSL will be hosting its 14th annual fund-raising dinner dance at the Thistle Heathrow T 5 Hotel in London on 22nd September 2018. This year’s fund-raising event is in aid of Solar Village Project in Sri Lanka. APSL Solar Village concept developed by one of the APSL past Presidents, Prof. I. M. Dharmadasa, focuses on the rural communities who are off the national grid or cannot afford commercially available alternatives and trapped in poverty due to various reasons. The project is developed so those rural communities will learn to help themselves in meeting their energy needs. Similar projects were successfully completed in past including the recent project in Nochchiya Solar village in Kurunegala District. Every year this annual event is dedicated to fund a worthy cause/project in Sri Lanka and last year we raised funds to establish an APSL Cancer Relief Fund in Sri Lanka, to provide much-needed medicines and other support to Cancer Patients in Sri Lanka.